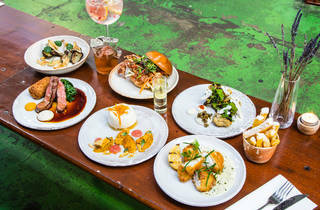 Venue says Dedicated to sourcing the finest ingredients to create innovative, unique, contemporary and seasonal dishes. A modern British seafood restaurant inside Tooting's covered Broadway Market. Got a seafood-hater in your life? Take them to Sea Garden. Not just because, in spite of the name, it goes beyond dispensing the fruits of the sea. But because the seafood is excellent, and is all served in small portions, which means you (they) can order plenty and push past your (their) comfort zone. Death to comfort, I say. The style is ‘pimped classics’. 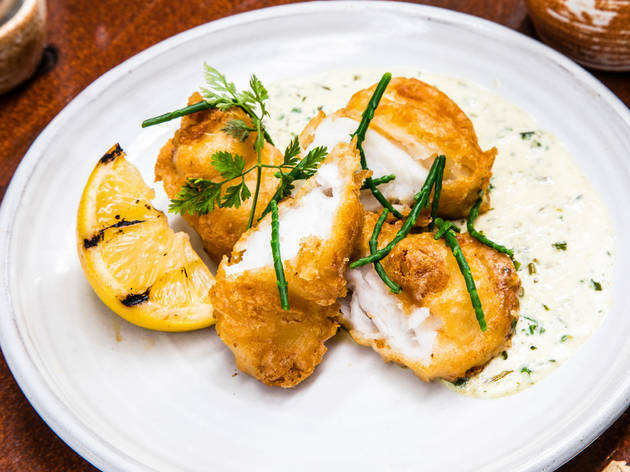 Like a small plate of oversized fish goujons, where the dark golden batter (made with brown ale, cooked in beef dripping) was a crisp overcoat for succulent hake over a creamy, caper-studded, Pernod-laced tartar sauce. Before being prettily strewn with strands of firm samphire and frilly chervil. So good. Or a bowl of fat, juicy, stonkingly fresh mussels with a garlicky cider cream sauce, freckled with stubby lardons. 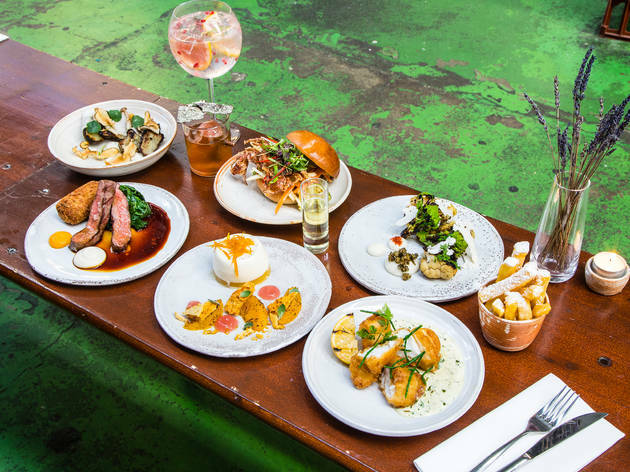 But – and here’s where your seafood-hater mate can breathe-two-three-four – there are almost as many meat and veg dishes, and they’re definitely not the poor cousins. If anything, they’re a touch more creative than the fishy ones. In particular, the kitchen does great things with veg. I mean, magnificent, posh-West End-restaurant kinds of things. Take the ‘Textures of Jerusalem’, a careful composition of jerusalem artichoke every which way. And as gorgeous to look at as to eat. There were dainty, crisped-up slices. There were sweet, tender, straight-off-the-grill chunks. And the whole lot came punctuated by Lilliputian pickled shimeji mushrooms. It was ravishing. Equally brilliant was its twin: ‘Textures of Cauliflower’. Again, in the many forms of choux-fleur, from raw slivers (looking brilliantly clinical, like the cross-sections of bite-sized brains) to charred, beautifully al dente chunks or even the occasional floret of romanesco (you know, that green cauli you always thought was a type of broccoli: whole ones are a bit like a ball of tiny Christmas trees.) The chips were excellent. You get a brutally small tin, so don’t attempt to share, but they’re everything you want out of a chip. Extremely crunchy on the outside. Exceptionally fluffy on the inside. The fact that they come with an optional ‘dusting’ of vinegar powder is a bonus: a slight affectation, sure, but a fun one. There’s usually a surf and turf, too (on my visit, meaty octopus, chorizo and tender pork belly, with a wild garlic and hazelnut pesto) and a plate of flat iron steak: perfectly pink-middled and served with a mushroom croquette, wilted cavolo nero and a madeira sauce. Go for those, too. But the star of the night – and I’ll say this as someone who’s picky about pud – was a dessert of raw, organic, honey panna cotta. It had shards and blobs: a piece of honeycomb here, a sliver of charred orange there. Small beads of orange jelly. And a shot of homemade yuzu orange liquor alongside. Maybe I’m just a sucker for a shot. All of this would be impressive in central London, in a more traditional setting. The fact that it’s being delivered out of a tiny kitchen in the corner of Tooting’s lovably scruffy Broadway Market is all the more impressive. Staff – including ebullient co-owner Jimmy Luttman, who used to be a fitter of antique fireplaces – are laid back and hugely friendly. On my weeknight visit, every seat at the small counter was taken, as was every spot at the communal tables out in the covered market corridor. A few final tips: you’ll find it on the same corridor as fellow trailblazer Plot. They have heaters, but it’s worth taking a coat. It’s cash only. But you can book. Got it? Now, gather ye seafood-haters and start the crusade. 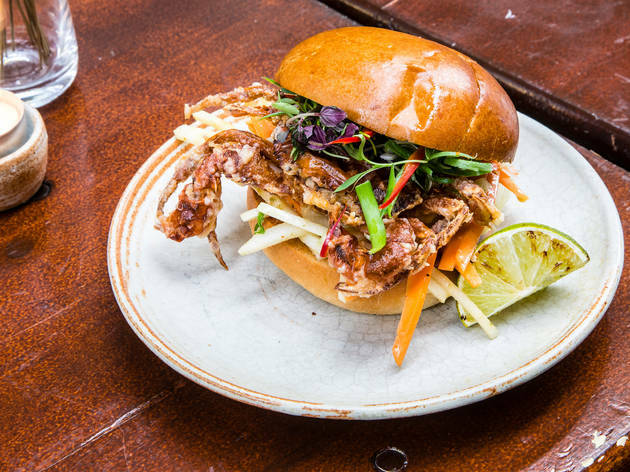 Located in the heart of Broadway Market in Tooting, Sea Garden & Grill is a modern British seafood restaurant. Dedicated to sourcing the finest ingredients combined with innovative recipes our chefs skills and passion for food creates unique, contemporary and seasonal dishes. Our seafood is delivered fresh daily from St Ives in Cornwall and our free range meat is sourced from local farms. BBQ dishes are prepared using the famous Big Green Egg. 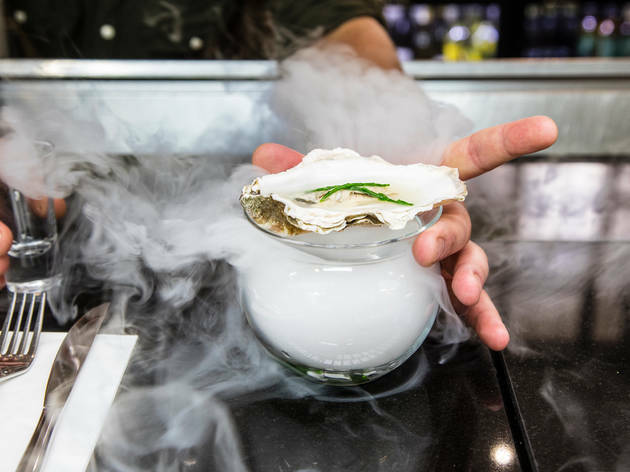 An ever changing menu is perfectly complimented with Sea Garden inspired cocktails using British spirits and homemade infusions and our warm and knowledgeable staff will guide you through your dining experience. What a creative way to enjoy food. They really put some thought and effort into the dishes. They were experimental and the plating of them was like that of which you'd see at a fine dining restaurant. The flavours were very good and we all came away slightly blown away and unprepared for such delights! The only reason it doesn't get 5 stars is because it's so far away and hidden in the tooting market!